My husband, Chuck, and I moved to Fredericksburg from Clarke County, VA. We lived in that area of the Shenandoah Valley for 30 years. Since 2013, Chuck has kept busy working as Planning Director for the City of Fredericksburg. After three years of weekend commuting, we sold our property in Clarke County and I permanently joined Chuck in the Burg in the year 2016. I keep busy connecting with the community through church, the Food Co-op, ESL volunteering, and friends. I have had diverse and interesting working experiences. From mortgage lending and database management to landscape gardening and design. My last stint was five years as a full-charge bookkeeper at a Cistercian abbey, but that’s a whole ‘nother story. I went to the Farmer’s Market at Hurkamp Park on a Saturday morning. That’s where I first learned about it. I remember buying a t-shirt from Rich Larochelle that day and I joined a couple months later through co-op member Troy Coghill’s influence while he was making improvements to our house as a building contractor with Rappahannock Restorations. Did you know Troy is a musician and song writer too? I have tabled and provided food for a variety of events since I joined. You will usually see me every fourth Wednesday at the Plants-Based Cooking Class at St. George’s Episcopal Church, 905 Princess Anne St. I usually table that event with fellow member and buddy Kathy Carmine. Currently, I am the volunteer Capital Campaign Coordinator for the Co-op. We are planning to launch the Member Investment Capital Campaign on April 8th this year. Soon! We’ll be contacting all you members by letter and by phone. Don’t be anxious when we call you. We belong to the same Food Co-op you belong to. For me, volunteering is about people. Meeting people, helping people, and connecting with people. And the Food Co-op is made up of great people who want to make a difference in the community. That’s what makes Food Co-op volunteering so worthwhile. A successful capital campaign to bring to fruition our member-owned grocery store with the opportunity of membership investing to have ownership in a grocery store. A grocery store that makes a difference with people like you. There’s definitely a passion for good, healthy food here. I appreciate the diversity and the availability of it, whether eating with friends at our home table or out on the town. What one local food experience would you not want our readers to miss? Healthy and interesting food tasting after the many events the Food Coop offers monthly to the community. 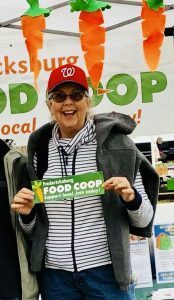 If you have an interest in healthy food, the local economy, our environment, continuing education, and a sense of community, then you will want to be a Co-op member. You belong with us!